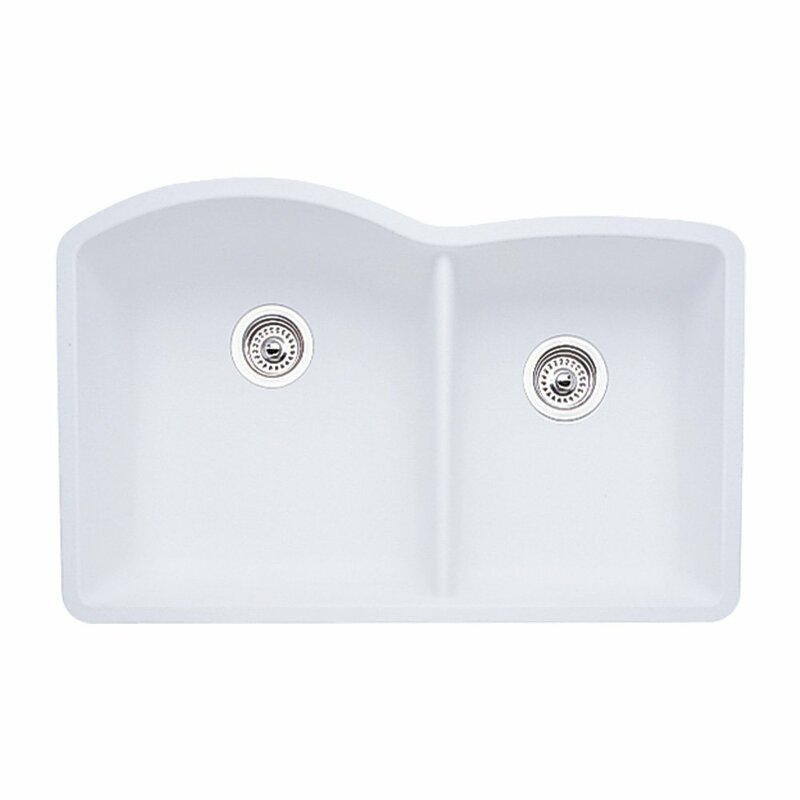 We choose sinks to review on our site that offer something well beyond what the average sink in their particular category does, and the Blanco Diamond is no exception. It offers a great value for money, and impresses in pretty much every department despite its modest price tag. Let’s understand what exactly it has to offer in more detail in this review. You really may not be able to find what the Blanco Diamond offers in terms of style and looks at this price point. The sink has a feel and look of natural stone, which looks very unique and makes the sink a focal point in your kitchen. While granite sinks are usually anything but unimpressive, the Diamond manages to be surprisingly attractive even by granite sinks’ standard. It’s a double bowl sink, but unlike many other double bowl sinks, the style and look of the Diamond is its most highlighting feature. The curved side of the larger bowl gives the entire sink a sophisticated and modern look, something you usually wouldn’t find unless when researching other high-end sinks. The Diamond is made using 80% solid granite, and given how durable granite usually is, you can expect the Diamond to be holding up well even after years of regular use. However, although granite is a very durable material, a common issue with some granite sinks is that they tend to chip, especially if the user ends up banging a heavy utensil hard into them. But to your surprise, the Diamond is highly resistant to chipping, so it would be able to handle any accidental dropping of heavy utensils without getting damaged in any way. Apart from that, it’s also non-porous, which further adds to its durability, making it much more durable than the average granite sink in this price range. Finally, it’s also resistant to scratching, thanks to its granite-backed natural stone touch. So besides being durable, it’s also going to retain its gorgeous look extremely well for years to come, which is otherwise often ruined by scratches. 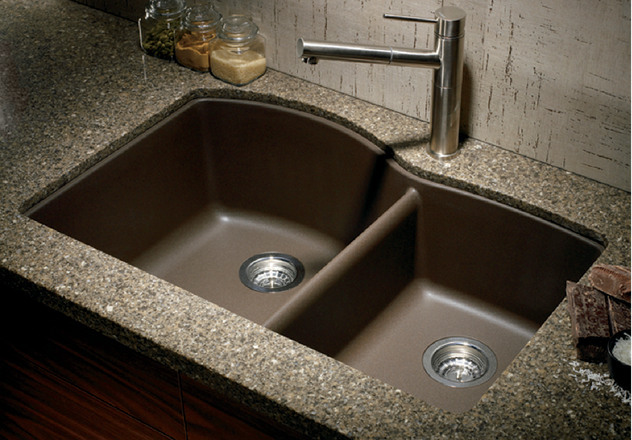 We are usually wary of granite sinks in this price range that come with a premium look. This is because they often compromise on either one of the other two most important factors: the durability or the functionality. And this is why we were surprised with what the Blanco Diamond has to offer in this aspect, as it’s perfectly functional to effectively accommodate all of the needs of an average user. While its smaller bowl is ideal for low-scale use such as rinsing vegetables, soaking pans and pots, and other similar things, the larger bowl takes care of the heavy-duty cleaning. It’s actually large enough to let you conveniently clean the largest of your utensils. But that’s all without giving you a hard time when cleaning the sink. Yes, compared to many other granite sinks, the Diamond is a breeze to clean and maintain. While its finish is not very smooth due to the natural stone appeal, you wouldn’t have any problem cleaning the sink easily and quickly. Not only that, but it’s also very easy to keep clean, meaning that you won’t find yourself cleaning it every now and then, which is another issue not easily avoidable when using one of these cheaper granite sinks. If you have read through everything we discussed above, you would know that there’s little doubt that we would recommend the Blanco Diamond in a heartbeat. Not only does it look super attractive, it’s also very durable and functional while being resistant to chipping and scratching as well. And this is all at a great price for a granite sink. There really aren’t many better options in this price range if you’re after an all-round granite sink.